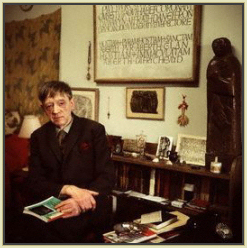 Below are six samples of David Jones's inscriptions that are currently available on the internet. Most of the places listed below have additional works by Jones, including paintings, drawings and engravings. Visits to those sites will yield further glimpses into Jones's prolific talent as both a visual & literary artist. 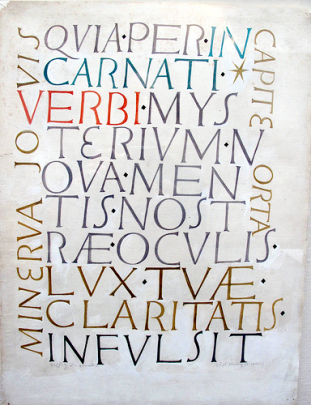 background and wax crayon technique have been replaced by letters in different colours on white paper; and secondly Jones introduces here his practice of combining fragments from different texts, so as to give visual form to a complex of inter-related meaning. 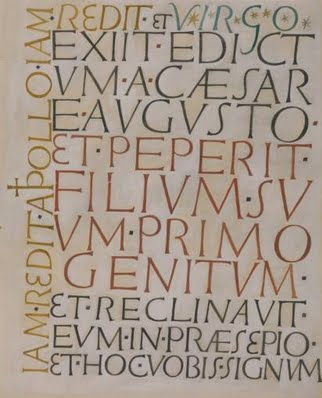 The inscription reads: "QUIA PER INCARNATI VERBI MYSTERIVM (For by the mystery of the Word made flesh) NOVA MENTIS NOSTRAE OCVLIS LVX TVAE CLARITATIS INFULSIT (the light of thy brightness has shone anew into the eyes of our mind) MINERVA JOVIS CAPITE ORTA (Minerva has sprung from the head of Jove). until a decree of the Sacred Congregation of Rites for some inexplicable reason, disallowed its use on Corpus Christi some years back, I think in the late nineteen-fifties. This seems very regrettable, because its use on Corpus Xti provided a liturgical link between the Word made Flesh in the stable and what is made present at the Mass. 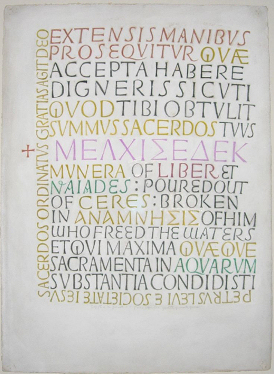 The words round the margin Minerva Jovis capite orta were proposed (I think by one of the Pontiffs in perhaps the sixteenth century, not sure) as expressing the Eternal Generation of the Son from the Father, but the proposition was not found acceptable." 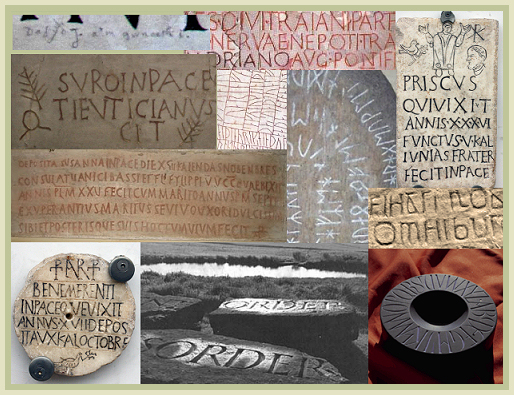 working on inscriptions for the first time as an art form. The text is from Malory's Morte Darthur 'here lies Arthur, the once and future King'. 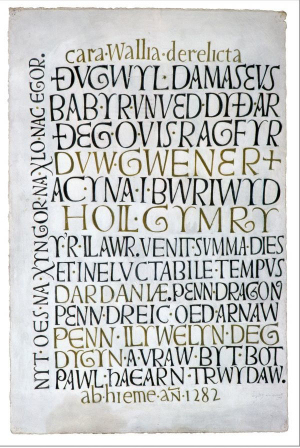 Jones is seen here experimenting both technically with the use of pencil on wax crayon and also with the letter forms which show an influence of early medieval inscriptions. Hills comments 'He was not, however, I am sure, trying to recreate an historic style, his reaction to the Romano-Celtic connotations of the Arthurian myth was much more personal and complex.' 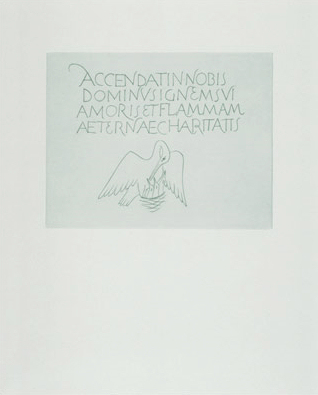 (Exhibition catalogue, David Jones, London, 1981, p. 129). The Letter Exchange and Rupert Otten.